For a birder, the best presents are those that money can’t buy. Like a backyard owl on Christmas Eve, or a redpoll at the feeder the next morning. Events such as these would clinch a happy holiday for anybody who appreciates birds. -- A second field guide. It really helps to have a second resource, especially when confronted with an identification challenge. I refer to the Peterson, Sibley and National Geographic guides all the time. Each book has unique strengths. -- Binoculars. This is a sensitive gift choice. Like neckties for men, it’s best to let birders choose their own optics. That said, a good pair of binoculars is potentially the most useful and most appreciated gift you can bestow. And every birder needs a reliable secondary pair. But unless you know exactly what the birder wants, buy a gift certificate. -- A new feeder. Consider a specialty feeder that will help attract more species. A tube-style thistle feeder will draw goldfinches and pine siskins, or go with a peanut feeder to serve chickadees, nuthatches and woodpeckers. If choosing a hummingbird feeder, look for a durable design—many glass ones are beautiful works of art but not very practical. -- Heated birdbath. Fresh water is a backyard magnet for birds any time of year, especially during winter. Cleaning and filling is a chore when it’s frigid outside but the results will justify the effort. -- Bird seed storage container. Not a glamorous gift, I know, but keeping seed dry, fresh and safe from garage critters is important. Select a container designed specifically for this purpose. Mine is heavy-duty plastic with an airtight lid and holds 25 pounds of seed. If you give one of these, fill it up with black-oil sunflower seeds and maybe bury a surprise. -- Bird song CDs. Identification becomes a lot easier when you learn the songs and call notes. And those who know them tend to find more birds. The Peterson “Birding by Ear” series is excellent. -- A good book. This was a banner year for birders who like to read. Amazingly, three full-length biographies on John James Audubon appeared. Two other new books tell the sad but fascinating story of the ivory-billed woodpecker. And birders are still talking about “The Big Year.” It’s highly entertaining, and also recommended for non-birder spouses who need to realize that birding obsessions are truly a matter of degree. “The Birdwatcher’s Companion” is another recent title worth investigating. -- Memberships. The ones I think of first are the DuPage Birding Club and Kane County Audubon. Either club will open doors to new birding adventures and new friends who are eager to share the hobby. Or how about The Morton Arboretum? It’s one of this area’s best birding spots and the new visitor center makes it better than ever. -- Magazines. You couldn’t go wrong by giving a subscription to Bird Watcher’s Digest or Birder’s World. Each is published six times a year. -- Bird-a-day calendar. I love these things. Along with great photos, they offer interesting facts about common species and introduce us to exotic ones. The featured species on Sept. 25, for example, was East Africa’s bare-faced go-away bird. I quickly added that one to my running list of favorite bird names. Right after superb fairy wren. I hope that your holidays are equally superb, and that you take some time to enjoy the birds! One of the questions I hear often is, How did you get interested in birdwatching? Maybe you’ve been asked the same thing. Most birders, I’ve found, rather enjoy talking about their earliest experiences in birding—in particular, the “spark” that triggered their interest and got them going in the hobby. I always like hearing these stories, and I’ve selfishly decided to devote this column to telling my own. For many birders, the spark was a particular bird sighting. That was the case with me, and it happened in 1994 at Kiawah Island, South Carolina. One day on my way to or from the beach I noticed a bright yellow bird flitting around in a thicket. I noticed right away it had some distinctive markings so I crouched down and tried to get a better look. The bird was cooperative, and I quickly realized I’d never seen anything like it. But what could it be? Luckily, our cottage at Kiawah contained a field guide to the birds. Within minutes I was able to match the image in my head with one in the book. Success! No doubt about it, I’d seen a male hooded warbler. The whole process of observation followed by a positive identification was very satisfying. The next day I went to Kiawah’s nature center to ask if “my bird” was anything unusual. That’s when I discovered that the resort had real live naturalists on staff who knew the local birds and offered guided bird walks. Best of all, they’d published a bird checklist just for Kiawah. The list showed all the species that had ever been sighted on the island and their relative abundance during each of the four seasons. Cool! Until then I never realized people were keeping such close track of things. And there on the list was the hooded warbler, rated R for rare. Clearly I’d been lucky the day before, and now I couldn’t wait to see what else I could find. With checklist in hand I was off to the races. I spent the rest of the vacation looking for birds, doing the best I could without binoculars. The treasure hunt was on. Almost overnight, I’d become a birder. I’ve been back to Kiawah many times since 1994 because my wife’s parents now have a permanent home there (more luck). Since that hooded warbler, I’ve seen another 120 species on the island, including my first gull-billed tern two months ago. It’s truly an exceptional place to watch birds, especially shorebirds and waders. And for me, it’s where a spark turned into a flame. Do you have a “spark story” too? Please share, and I’ll try to include your responses in an upcoming column. There are many kinds of birds that most likely will never turn up in your yard. But some of them are not that far away. With a little effort, and if you know where to go, you can find them. I call them “destination” birds. My destination on one of the first really warm days of June was Midewin National Tallgrass Prairie in Wilmington, about 15 miles south of Joliet. The site is widely known for its abundance of grassland bird species, and now it’s more accessible than ever. On June 5, about 5,000 acres of Midewin were opened to the public for the first time. I was there the very next day, taking advantage of one of this region’s prime birding opportunities. Midewin was established in 1996 as the first national tallgrass prairie in the country. It’s on the site of the former Joliet Arsenal, where explosives were manufactured, packaged and stockpiled by the U.S. Army. Grass-covered concrete storage bunkers still dot portions of the 20,000-acre property. Birding groups have been going to Midewin during the last eight years for pre-arranged tours conducted by the U.S. Forest Service. Now you can experience the prairie on your own. Several easy, self-guided hiking trails are set up that offer a nice variety of birds, butterflies and wildflowers. My target, of course, was grassland birds. Two minutes into Midewin’s new Henslow Trail I was watching a singing Dickcissel. I’d only seen this species once before, and throughout the day I’d see many more. There were plenty of Bobolinks too, filling my ears with their bizarre in-flight vocalizations. True to its name, the Henslow Trail takes visitors through ideal habitat for the endangered Henslow’s Sparrow, another bird I really hoped to see. Well, I didn’t see one, but I heard several. My luck was better with Grasshopper Sparrow, another grassland specialty. Twice I was able to watch one perform the high-frequency trill that inspired this species’ name. Midewin’s bird variety is not limited to grassland residents. My “bird of the day,” in fact, was a Loggerhead Shrike. I’d never seen one before in Illinois, where it’s designated as a threatened species. Other sightings included Northern Mockingbird, Brown Thrasher, Yellow Warbler and numerous Eastern Kingbirds and Indigo Buntings. One of the pleasures of Midewin is the wide-open prairie itself. There are some impressive vistas already and the best is yet to come. The goal is to restore the entire preserve to native prairie and build many more miles of hiking trails. It’s a massive undertaking that could take up to 20 years. Now is a great time to explore Midewin. The Forest Service is offering birding tours at 7:30 a.m. on July 3rd, 17th and 24th. Details about these and other nature programs are available by calling (815) 423-6370. Or visit Midewin’s website at www.fs.fed.us/mntp/. Hey birders, we can watch butterflies too! As I said before, “Kingbird Highway” by Kenn Kaufman is my all-time favorite book about birding. So when the author spoke at the Morton Arboretum recently I made a point to go listen. But Kaufman’s visit wasn’t just about birds; his main topic was butterflies. I’m not in that category yet, but I’ll admit that butterflies are high on my list of favorite things. In fact it was butterflies, not birds, which fascinated me as a child. I collected them, and my hometown newspaper back in Ohio even did a story about me and my unusual hobby. The headline was “Butterflies Bug Him”—something my older brother never lets me forget. Today, unless you are a lepidopterist, it’s generally not “PC” to capture and collect butterflies. Most people prefer to just watch them and try to identify them, just as we do with birds. That’s a lot easier than catching and mounting the little buggers anyway. I don’t keep a “life list” of all the butterflies I’ve seen, but I have started keeping track of what I see in the yard. My list is short but growing. As with birds, the more I look the more I see—it’s amazing how many things are flying around if we take time to notice. Most butterflies are very small, with wingspans less than an inch, so identification can be a big challenge. I purchased Kaufman’s new butterfly field guide to help me with that. The only other essential tool is a pair of binoculars with close-focus capability. Your birding optics are probably fine. When he was working on his field guide Kaufman says a few hard-core birders accused him of being a traitor. They couldn’t believe he was turning his back on the birds. But of course that wasn’t true at all; Kaufman loves birds as much as ever. With butterflies he’s just branching out into a related field. He says he’s also motivated by the chance to call more attention to important conservation issues. Habitat loss—the decline in native vegetation such as tallgrass prairie—is a major threat to many butterfly species. The Regal Fritillary, for example, has virtually disappeared from its former range east of the Mississippi River, including Illinois. Kaufman’s presentation really opened my eyes. Maybe I’ve been a little too one-dimensional. Birds are still No. 1, but now I’m looking at butterflies a lot more closely. They’re starting to bug me again. Back in January I wrote that one of the best things about birdwatching is the surprise factor—like “a box of chocolates,” remember? That’s especially true right now, when scores of bird species are migrating through our region. In the backyard or in the woods, it’s the time of year when almost anything is possible. For birders, it doesn’t get any better than May. I’ve been reminded of that almost every day this month, and I hope you too have been outside enjoying the avian marvels of late spring. From about mid-April until June I wake up extra early to have my coffee with the birds. On most days I’m on the back patio by 6:00 a.m. The neighbors must think I’m crazy. Or worse, creepy, since I’m always peering through binoculars. But so far nobody has called the police, and I appreciate my neighbors for that. Even more, I appreciate their big, tall trees. Outside on dawn patrol, I’m scanning everything that grows, looking for movement. And listening, too. I know the regular backyard sounds well enough to recognize when something unusual is flitting around. Then it’s just a matter of finding the vocalist. This spring I’ve had some exciting first-time visitors: a blue-gray gnatcatcher, a brown thrasher and an indigo bunting. These are common birds—you can find them rather easily any April or May in their usual habitats. But there’s nothing common about them when it comes to my yard. It took almost seven years in this location to finally add them to my coveted yard list, which is now up to 89 species. As expected, it’s been a terrific month to spot members of the warbler family. I’ve had backyard views of 11 species, including bay-breasted, blackpoll, Cape May and magnolia. Good birds, all of them, and I’m hoping to squeeze out a few more before summer sets in. On May 8, I took part in the Spring Count, a statewide event that supplies important data to people who study bird population trends. If weather conditions are right, these annual one-day birdathons can produce amazing numbers and variety. This year I was on a counting team that covered the Morton Arboretum in Lisle. It was a terrific day in the field: We tallied 102 species, including 23 kinds of warblers and five types of vireos. My favorite sightings, however, were birds of prey. Early on we found two young great-horned owls in plain view, snuggled up close on the same branch. Too bad I’m not a photographer! Then, near the end of the day, we watched a peregrine falcon soaring over the Arb’s west side. I see peregrines occasionally in downtown Chicago but this was my first in DuPage County. On the eve of the Spring Count, or before any May bird outing, I get far too excited for my own good, thinking about the possibilities. I’m like a kid the night before Christmas, dreaming of brightly colored packages—the kind with feathers. Will tomorrow be the day I see my first worm-eating warbler? Or my first Kentucky? Will a new species visit the yard? First-time sightings are always special, but in May I savor everything. One can never see too many scarlet tanagers or Baltimore orioles or Blackburnian warblers. I “need” these birds every year, and pursuing them is a spring ritual that’s always worth the effort. Sometimes I look around my garage and basement and wonder: Where did all these feeders and birdbaths and squirrel baffles and poles come from? My dust-gathering “inventory” is a birder’s garage sale just waiting to happen. If you’re a backyard bird feeder like me, you understand—there’s a trial and error factor that goes with the hobby. We’ve been in our present home for almost seven years, feeding the birds from day one, and only now do I feel like we have all the right pieces in place. Since I enjoy hearing about how other birders entertain their feathered guests, I thought maybe you’d like to hear about my own backyard tactics. I keep things pretty simple on our tiny plot—three tube-style feeders and one birdbath with a dripper. The feeders are filled with black oil sunflower seeds, shelled peanuts and thistle seed. I think of the sunflower seed feeder as the main course and the other two feeders as side dishes. In my view, if you only have one feeder, it should be filled with black oil sunflower seeds. This will satisfy a wide variety of birds, and cardinals especially. My peanut feeder is always busy. Yes, the nuts are a little pricey, and far too many of them end up in the bellies of starlings and house sparrows. But without the feeder, I’d miss watching one of my favorite backyard birds, the red-breasted nuthatch. Two kinds of woodpeckers—downy and red-bellied—also enjoy the peanuts and I like having them around, too. The thistle was discovered by some pine siskins last December and, amazingly, they stayed until the end of April before finally departing for their summer homes in Canada. Now the bright yellow American goldfinches have the feeder all to themselves. For years I’ve been hoping that a common redpoll will stop by for a thistle snack, too. Not yet. Of course, birds come and go during the week and I never see them. I really appreciate when uncommon birds have the good sense to visit my yard on weekends. One of the nice things about the thistle tube is that squirrels don’t bother it. Not so with the other two feeders, of course. Currently I have the sunflower seed and peanut feeders hanging side by side on a double shepherd’s hook. A metal, cone-shaped baffle is attached to the pole about four feet up from the ground. Only a couple of squirrels have ever defeated it, and both are in the rodent hall of fame. From early May through September I maintain at least one hummingbird feeder. We don’t see a lot of hummers in the yard but it’s always a treat when we do. This month there’s a fancy new “specialty” feeder on the Reiter estate. Thinking warm thoughts, I sent away for an oriole feeder in the dead of winter. It’s made of wood and features two spikes for holding orange halves and a built-in cupholder for grape jelly. I’m optimistic that it will attract a few of those flashy Baltimore orioles as advertised. However, part of me knows this was an unnecessary purchase. Here’s why: Last May, in a classic case of beginner’s luck, I had an oriole stop by just four hours after I’d put out some orange halves. It was the first time I’d ever put out oranges, which I attached to the tops of a couple fence posts. Two nails, one orange, one oriole. Simple can be good. How far would you go to see a rare bird? I guess my own limit is about 110 miles. In November 1999 I drove to Jasper-Pulaski Wildlife Area in Indiana for the chance of seeing a common crane—a vagrant Eurasian species that occurs in the United States only once in a blue moon. According to Internet reports, a single common crane had been spotted among the hundreds of sandhill cranes at Jasper-Pulaski a few days earlier. This was possibly a once-in-a-lifetime chance. I had to go. Fortunately, the effort paid off for me and for the throngs of other birders on the scene. I remember chatting with one guy who had just flown in from Baltimore. Yes, just to see a bird. Telling this story is my way of admitting that I, like many birders, can be a little obsessive. We are not always rational when the chance arises to see something new—especially something rare. Still, I don’t know anybody like the main characters in “The Big Year,” a new book about three men who stop at nothing (and spare no expense) in their quest to set a new U.S. record for most bird species seen in a single calendar year. “The Big Year” reveals a crazy, competitive side of birdwatching that bears little resemblance to the hobby as most of us know it. You might want to pick up a copy just for laughs. But when it comes to books about pursuing birds, I can highly recommend three. These stories, all published in the 1990s, will make you want to pack up the binoculars and field guides and hit the road. “The Feather Quest” by Pete Dunne takes you on a guided tour of the country’s birding hot spots. Whether or not you’ve ever been to places like Southeast Arizona, Everglades National Park or Cape May, N.J., you’ll enjoy Dunne’s entertaining accounts. He has a way with words, to say the least. Near the end there’s a riveting chapter based on a visit with the late Roger Tory Peterson, who wrote the book’s introduction. “Kingbird Highway” by Kenn Kaufman is another entertaining read and rates as my all-time favorite bird book. It’s the story of Kaufman’s remarkable personal mission to see as many birds as possible in a single year. But unlike the “The Big Year” characters, he carried out his plan as a teenager with no money in his pockets, hitchhiking back and forth across the country multiple times. Kaufman, like Dunne, is today about as famous as a birder can be. “Chasing Warblers” by Bob and Vera Thornton is more obscure. It documents the authors’ attempt to find and photograph all 52 species of wood warblers in the United States. Seeing certain birds can be tough enough, but taking high-quality pictures of them is a far greater challenge. The effort behind this book is truly extraordinary. Buy it for the pictures and read it to see how the Thornton’s managed to pull it off. All of these books are interesting and readable, in part because they are not just about birds. They’re also about the people—some birders and some not—encountered out on the open road. Each book will captivate anyone who likes birds and likes to visit new places in search of them. Happy trails. If you ever have the chance to go birding in high winds and snow squalls please take my advice: don’t. I encountered both bird-deterring elements during an early March visit to Willowbrook Wildlife Center in Glen Ellyn. My quick loop around the preserve’s nature trail yielded only one notable species, a brown creeper. Trust me, in better weather, Willowbrook is a great place for birdwatching. It’s really a special piece of property. The Center’s short nature trail feature four distinct habitats—wetlands, prairie, savannah and woodland. This attracts a wide variety of birds. Carl Strang, a naturalist with the Forest Preserve District of DuPage County, says 146 species have been documented at Willowbrook, not counting injured or sick birds that have been brought in for treatment. (The Center is, after all, the area’s foremost wildlife care facility.) One of Strang’s most memorable sightings was a male Lawrence’s warbler—a bird so rare it took me three field guides before I could even find a picture of it. Other nice finds over the years include sedge wren, prothonotary warbler and Louisiana waterthrush. The latter two species were spotted alongside the little stream for which Willowbrook is named. There’s more. On two different occasions Strang witnessed a flyover osprey, and each bird was carrying a fish! Another time he watched an American bittern lift off from a tiny patch of wild rice and cattails in Willowbrook’s marsh. He likes that story a lot because it shows how even small landscape features can attract new birds. Habitat restoration work now in progress will give the preserve even more natural diversity. The preserve’s centerpiece is a restored four-acre prairie, where eastern bluebirds have nested for the past three years. Look for the bluebird boxes when you walk the trail. Besides the habitat variety, one of the things I like best about Willowbrook is its compactness. The entire property is 50 acres and the nature trail is less than a mile around. So it’s a great birding option if you just have an hour, and a good bird walk for young children with short attention spans. Willowbrook’s live animal exhibits are worth a look, too. A series of outdoor cages contain some impressive raptors, including bald and golden eagles, turkey vultures and four kinds of owls. These are birds that were treated for injuries and are now permanently disabled. Now they play an educational role. A surprisingly wide variety of smaller birds are on display inside the main building. This is your chance for close-up views of a Baltimore oriole, rose-breasted grosbeak and American kestrel, plus hard-to-find species such as black-throated blue warbler, sora, purple martin and eastern screech owl. All the birds were brought to Willowbrook for treatment of injuries or disease. Fully recovered birds are released back into nature. But save the indoor exhibits for a rainy day. With spring migration now in full swing, it’s time to get outside and see some new birds. The friendly and knowledgeable staff at Willowbrook can help you with that. Guided tours of the nature trail will be offered at 9:00 a.m. on April 13 and 18, and May 18 and 22. Also on May 22, a program called “Birding by Ear” will begin at 7:30 a.m.
For more information, call (630) 942-6200 or visit www.willowbrookwildlife.org. The Center is located on Park Blvd. in Glen Ellyn, about a mile south of Roosevelt Road. On the last evening in January, with outside temperatures hovering just above zero, I went to church. But not for religious services. I was there to hear about birds. The venue was the New England Congregational Church in Aurora. The event was the annual benefit dinner and silent auction for the Fox Valley Wildlife Center. It was the organization’s largest fundraising event of the year, and it had the look of a major success. The patrons I observed—about 125 in all—certainly were not holding back at the auction tables. The event also served as a tribute to Kay Johnson, the wildlife center’s founder and past president, who recently retired. In an after-dinner ceremony, Johnson was honored for her lead role in establishing what is Kane County’s only wildlife rehabilitation facility. Located in the Elburn Woods Forest Preserve in Elburn, the center began caring for birds and animals in 2001. Then came the “sermon”—a presentation called Birding the Midwest by Kathy and Bob Andrini from St. Charles. Bob, a retired high school biology teacher, is president of the Kane County Audubon Society and teaches birdwatching courses at the College of DuPage. Kathy, his wife, is a former preschool teacher. Both are avid birders and enjoy sharing their expertise. In fact, on the same day as their presentation, the Andrinis led a group of COD students on a frigid eagle-watching trip to the Mississippi River. Fortunately, Bob and Kathy regained feeling in their toes and fingertips just in time to present their remarks and slides. And we birders do love looking at bird slides, especially in the dead of winter. Know how baseball fans get all warm and fuzzy thinking about the start of spring training? Same thing with birders, except when it’s cold and snowy we’re thinking about the return of Red-Winged Blackbirds in March, Yellow-Bellied Sapsuckers in April and, of course, the inevitable wave of migrating warblers in May. The Andrinis wisely geared their remarks to beginning birdwatchers. While the room was obviously full of people who support wildlife, only a handful were obsessed birders like me. The presentation was a nice introduction to the common birds of the Fox River Valley region and included some helpful tips on identification. My guess is that audience members were fairly impressed by the variety of bird species that can be seen in Kane and surrounding counties. Even a Bald Eagle, if you’re lucky. Of course, seeing the birds is one thing, taking pictures is another. Nature photography is an art that requires great patience and skill. Judging by his slides, Bob Andrini has plenty of each. His many close-up shots were achieved by “digiscoping”—a process where one attaches a digital camera to a tripod-mounted spotting scope, which is what birders call their fancy telescopes. For distant subjects, like ducks on a lake, digiscoping is a great way to document your sightings. The method can yield amazing photos of your backyard feeder birds, too. Most of Bob’s photos were taken on the Fox River or at Nelson Lake Marsh near Batavia—one of the area’s outstanding sites for waterfowl and marsh birds. 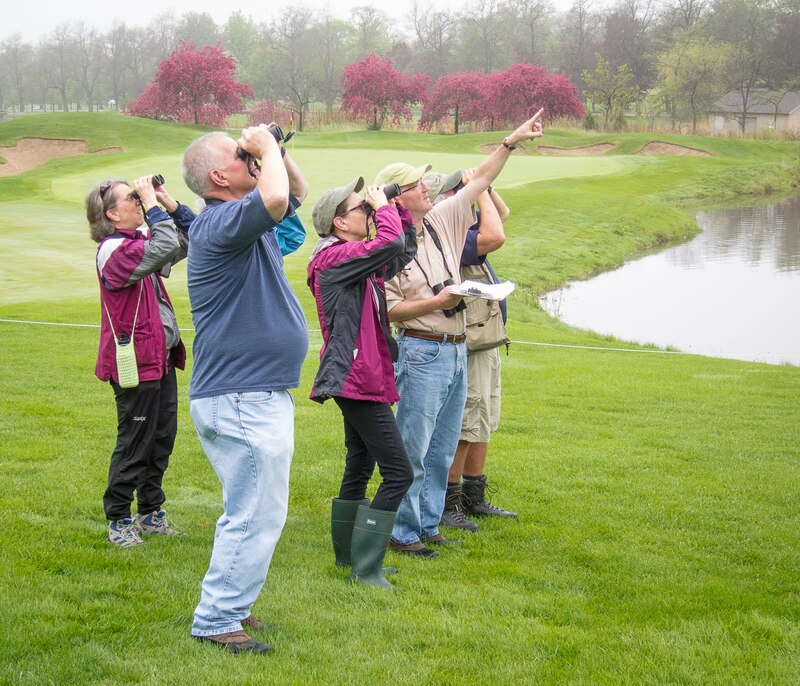 Kane County Audubon leads a birdwalk at Nelson Lake at 8:00am on the first Saturday of every month. The walks are open to everyone. If you’re a casual backyard birdwatcher and want to see some new birds in a diverse habitat, this is a great opportunity. For more information, call 630-584-8386. Last year I went out of my way to see “Winged Migration” at a theater in Chicago. No regrets, the film was excellent, but turns out I could have saved myself some trouble—a few weeks later it came to Glen Ellyn and stayed for weeks on end. Imagine that, a bird documentary held over. The popular success of “Winged Migration,” in my view, is just the latest sign that birds are really something special. They can amaze and fascinate people who don’t even think of themselves as birdwatchers. And people are curious about them. I get bird questions all the time from friends and colleagues. Many of us have taken our curiosity to the next level. We are birdwatchers or “birders” and not afraid to admit it. The hobby is mainstream now, having moved beyond those old stereotypes involving little old ladies in sensible shoes. It’s big business, too. Have you noticed how much space our local hardware stores devote to birdseed, feeders and other supplies? And how about those specialty stores that cater specifically to birders? These are fairly recent developments. BusinessWeek, in an article titled “Where the Boomers Are Flocking,” reported in 2002 that the American birdwatching population now totals 46 million—up 10 percent from five years before. The U.S. Forest Service rates birding as the fastest growing outdoor activity. ** Birding is simple. The only essential equipment is a decent pair of binoculars and a field guide to help identify what you see. The cotton vest with 27 pockets can come later. ** Birding is like a box of chocolates. Really, at any place and time, you never know what you might see. This is particularly true during the spring and fall migration seasons, when a lot of non-resident birds are passing through Chicagoland. The more time you spend birding, the more you learn to expect the unexpected. Still, I am constantly being surprised, and that’s part of the fun. ** Birding is challenging. Learning to identify birds by sight and sound is the main thing. Then there are challenges like going on field trips in search of particular birds or the game of adding new species to your yard list (hint: watch for flyovers). ** Birding brings us closer to nature. I think most of us would like to feel more connected with the natural world. Birding satisfies that desire and broadens our horizons as well. In the spring, there’s something cool about spotting a scarlet tanager in your maple tree and knowing that a few weeks before it was probably somewhere in Central America. I’m not an ornithologist—just a local birder who loves the hobby and wants to share it. If you too have a passion for birds, this column is for you. But it’s also for anybody who has ever hung a feeder or birdhouse in the backyard. Birds can be appreciated and enjoyed in many ways, no matter what your age, fitness level or degree of interest. And thanks to “Winged Migration,” you can even enjoy them with popcorn.